The rechargeable lithium ion (Li-Ion) battery market will grow strongly and steadily with a 20% CAGR from 2016 – 2022. E-mobility provides opportunities for players already present in the battery industry, but also from other industries. The Li-Ion supply chain will be significantly reshaped. NMC have become a key material for a wide range of battery applications. But who has the best IP position? NMC battery ip activity is ramping up along with the market. 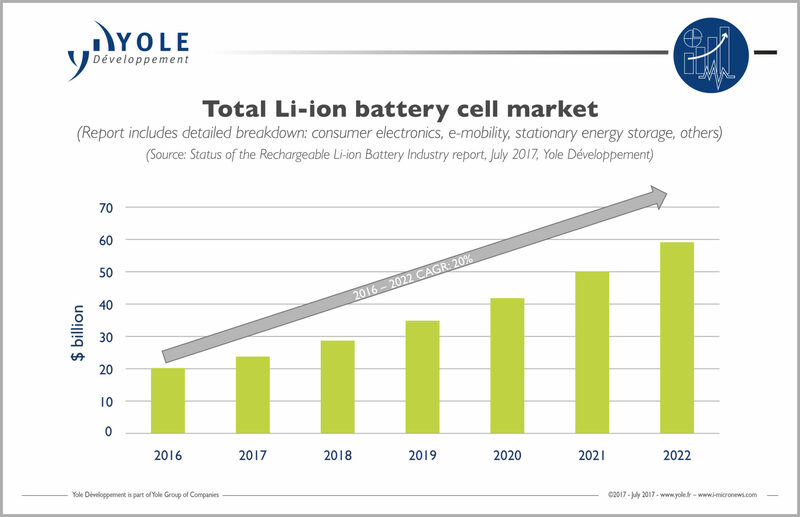 “The global demand for battery cells in GWh will rise by more than 400% between 2016 and 2022”, confirms Dr Milan Rosina, Senior Analyst, Energy Conversion & Emerging Materials at Yole. “Large manufacturing facilities will be built in coming years to satisfy such huge demand for Li-ion batteries” he adds. This growing demand is a real market opening and facilitates the entrance of new players. 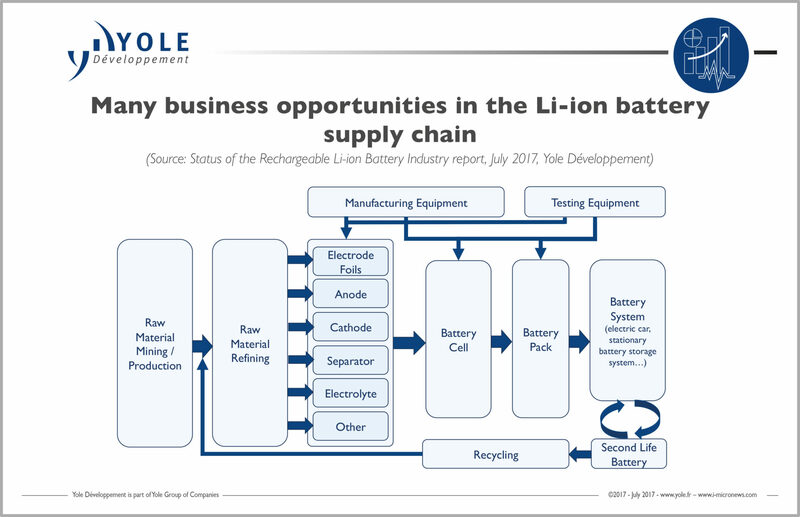 Therefore, Yole’s analysts identify numerous business opportunities within the Li-ion supply chain, from raw material mining to material preparation including cell component production, cell manufacturing, integration of battery cells into battery packs and final battery systems. This trend also facilitates the implementation of lot of innovations focused on materials, equipment and processes. “The Li-ion industry might therefore experience accelerated technology consolidation and supply chain reshaping” comments Dr Rosina. The most critical materials used in the Li-ion battery industry are cobalt, lithium and graphite. From consumer electronic to e-mobility applications, technical requirements are different. One example is in the cathode material. LiCoO2 (LCO) is mainly used in consumer electronics and was the dominant Li-ion cell cathode material in the past. Today, the largest cathode material segment is NMC , which better matches with the huge EV/HEV market needs, as well as other main applications. The multiple license agreements and the recent patent war between BASF/University of Chicago (Argonne) and Umicore confirm maturity of the NMC market. Therefore, more and more material suppliers and cell makers today focus their activities on NMC technology. “The number of mergers and acquisitions, patent litigations and license agreements should increase due to the growing number of companies operating in NMC materials, especially Chinese companies”, announces Nicolas Baron, CEO & Founder at KnowMade. 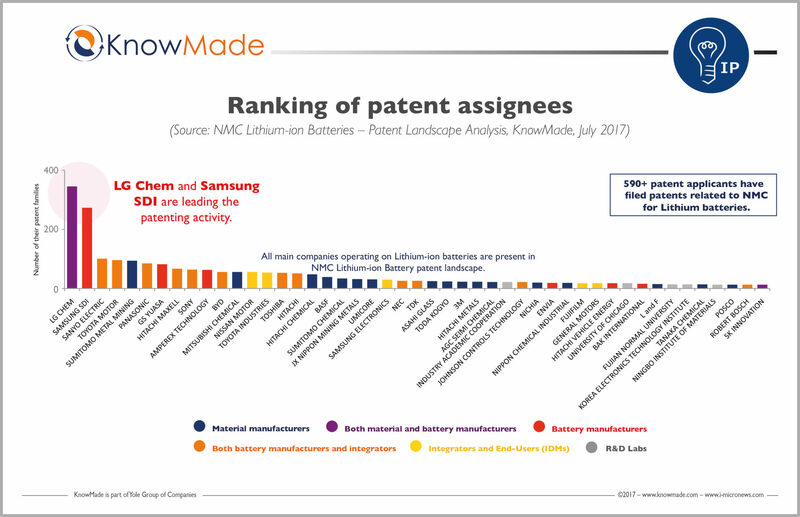 Other figures and analyses of the strategy of leading companies detailed in KnowMade’s patent landscape report confirm also the trend. For example, the number of enforceable patents is increasing worldwide, and several companies already stand out thanks to their strong IP position. “It is a critical time to understand the global competitive environment of NMC lithium-ion batteries from a patent perspective”, comments Dr Fleur Thissandier, Patent Analyst at KnowMade. “Therefore in-depth patent analyses of key technologies and players can help anticipate changes, detect business opportunities, mitigate risks and make strategic decisions to strengthen one’s market position and maximize return on one’s IP portfolio.” More than 3,300-patented inventions have been published worldwide up to March 2017 by more than 590 applicants. A detailed description of both reports is available on KnowMade website and on i-micronews.com, Batteries & Energy Management reports section.